TOKYO, JAPAN (AP) — The 4 ½-minute speech that has reverberated throughout Japan's modern history since it was delivered by Emperor Hirohito at the end of World War II has come back to life in digital form. Hirohito's "jewel voice" — muffled and nearly inaudible due to poor sound quality — was broadcast on Aug. 15, 1945, announcing Japan's surrender. On Saturday, the Imperial Household Agency released the digital version of the original sound ahead of the 70th anniversary of the speech and the war's end. In it, the emperor's voice appears clearer, slightly higher and more intense, but, Japanese today would still have trouble understanding the arcane language used by Hirohito. "The language was extremely difficult," said Tomie Kondo, 92, who listened to the 1945 broadcast in a monitoring room at public broadcaster NHK, where she worked as a newscaster. "It's well written if you read it, but I'm afraid not many people understood what he said." "Poor reception and sound quality of the radio made it even worse," she said. "I heard some people even thought they were supposed to fight even more. I think the speech would be incomprehensible to young people today." Every Japanese knows a part of the speech where Hirohito refers to his resolve for peace by "enduring the unendurable and suffering what is insufferable," a phrase repeatedly used in news and dramas about the war. When people heard that part 70 years ago, they understood the situation, Kondo says. But the rest is little known, largely because the text Hirohito read was deliberately written in arcane language making him sound authoritative and convincing as he sought people's understanding about Japan's surrender. Amid growing concern among many Japanese over nationalist Prime Minister Shinzo Abe's push to expand Japan's military role, the current Emperor Akihito is increasingly seen as liberal and pacifist, and the effort by his father, Hirohito, to end the war has captured national attention. Speaking in unique intonation that drops at the end of sentences, Hirohito opens his 1945 address with Japan's decision to accept the condition of surrender. He also expresses "the deepest sense of regret" to Asian countries that cooperated with Japan to gain "emancipation" from Western colonization. 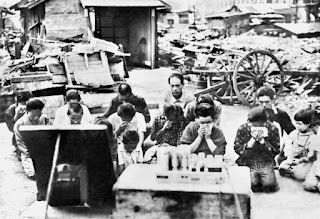 Japan itself colonized the Korean Peninsula and occupied parts of China, often brutally, before and during World War II. 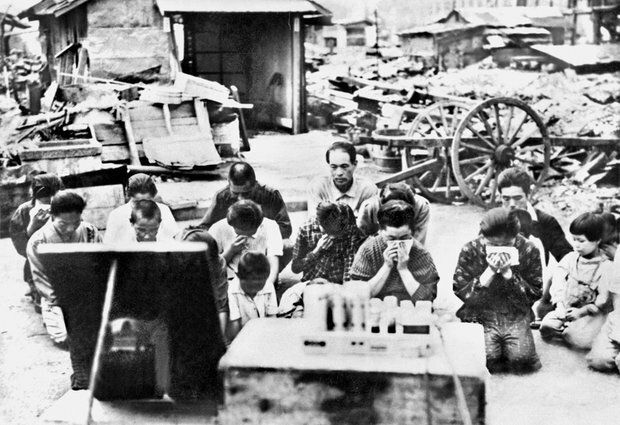 Hirohito also laments devastation caused by "a new and most cruel bomb" dropped in Hiroshima and Nagasaki, and asks everyone to stay calm while helping to reconstruct the country. Its significance is that Hirohito, who at the time was considered a living deity, made the address, said Takahisa Furukawa, a historian at Nihon University in Tokyo. "What's most important is the emperor reached out to the people to tell them that they had to surrender and end the war," he said. "The speech is a reminder of what it took to end the wrong war." On the eve of the announcement, Hirohito met with top government officials to approve Japan's surrender inside a bunker dug at the palace compound. Amid fear of violent protest by army officials refusing to end the war, the recording of Hirohito's announcement was made secretly. NHK technicians were quietly called in for the recording. At almost midnight, Hirohito appeared in his formal military uniform, and read the statement into the microphone, twice. The drama of the last two days of the war leading to Hirohito's radio address was made into a film, "Japan's Longest Day," in 1967, and its remake will hit Japanese theaters on Aug. 8.